This is Stuart, the one-eyed ukelele-playing Minions character you will find in the movie version. This adorable looking banana-colored ball of a character would be a great addition to your embroidery stitches project. Get this cross stitch work printed, and do share a photo of it with us when you’re done. Disclaimer: Minions is a trademark and copyright of Universal Studios. Licensed by Universal Studios Licensing LLC. All rights reserved. 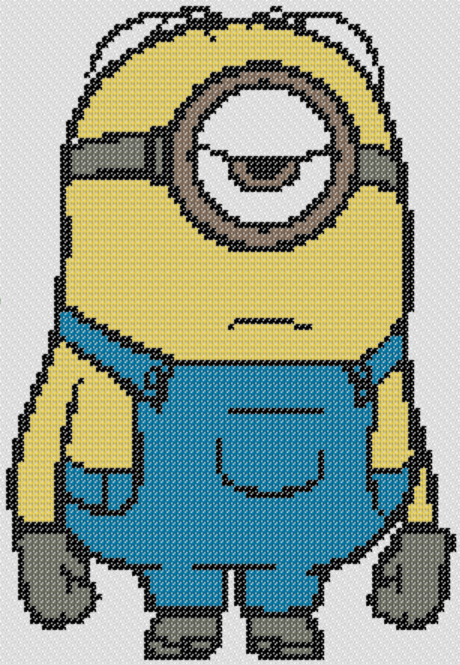 Cross stitch patterns found in this site bearing the Minions names and images are for personal use only. Download our Stuart (Minions) beginner cross stitch zipped file (approx. 535kb — downloaded 223 times) The password for this download is “crossstitch4free” without the quotation marks. Many of our free stitch patterns are based on our readers’ suggestions and requests. If you have your own request and am trying to find the crafting project appropriate for your stitching, contact us using our Contact Form. We plan to provide you with crossstitch supplies for sale soon, based on which free downloads are the most popular. We hope to make your search for the best cross stitch kits easy, especially if you are new to stitching, or if you would like to introduce this to your loved ones.